Filling Sudan’s ‘Fiscal Gap:’ A Question of the International Community’s Generosity or of Limiting Khartoum’s Defense Budget? Late last month, representatives from the Sudanese and South Sudanese governments met in Addis Ababa, Ethiopia under the auspices of the African Union High-Level Implementation Panel, or AUHIP, for yet another round of negotiations on outstanding North-South issues. Central among these issues are “financial transitional arrangements,” a euphemism for how much money Juba, along with, perhaps, the international community, can pay Khartoum to offset Sudan’s “fiscal gap” resulting from South Sudan’s secession. The South Sudanese government, the AUHIP, and the greater international community have largely embraced this concept of financial transitional arrangements as a viable option for assuaging Sudan financially following the South’s secession. There has, however, been a general lack of examination of the contradictions inherent in expecting South Sudan, possibly in conjunction with the international community, to fill at least a portion of Sudan’s “fiscal gap” while Khartoum continues to spend the vast majority of its budget on defense in part to carry out a sustained offensive against its own civilians. It has been reported that the Sudanese government spends nearly 70 percent of its annual budget on defense. The Sudan Armed Forces, or SAF, Sudanese militias, and other Sudanese security and defense apparatuses, in turn, use this huge allotment of the budget largely to target Sudanese civilian populations in Abyei, Blue Nile, Darfur, and South Kordofan. Through the analysis of DigitalGlobe satellite imagery since January 2011, the Satellite Sentinel Project, or SSP, has documented the deployment of forces in Abyei, South Kordofan, and Blue Nile consistent with at least one quarter of the total strength of the SAF. SSP has also documented the deployment of significant military hardware by the SAF in these areas, primarily vehicles consistent with Cold War-era tanks, bombers, fighters, and helicopter gunships. These deployments are in addition to consistent bombing campaigns, the sole purpose of which is to target civilian populations throughout the three areas. “Soldiers with small arms were chasing the civilians. They were supported by the Fellata [an ethnic group in Blue Nile], who captured some of the civilians and slaughtered people,” said Asma, who witnessed the outbreak of conflict in the town of Um Darfa. Enough staff documented similar accounts from refugees who have fled the ongoing conflict in South Kordofan to Yida refugee camp in South Sudan. 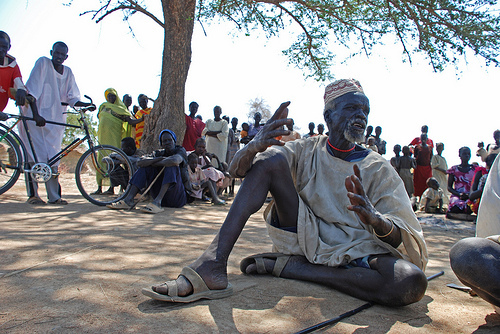 According to a United Nations Office for the Coordination of Humanitarian Affairs, or OCHA, report released earlier this month, over 1 million people are affected by fighting in South Kordofan and 200,000 people are affected in Blue Nile. Of these numbers, 200,000 individuals are either internally displaced or severely affected by fighting in South Kordofan. In Blue Nile, the figure is 60,000. In total, approximately 39,000 refugees have fled the fighting to either Ethiopia or South Sudan, a figure that rises daily. Contrast these clear violations of human rights, perpetrated by Sudanese and government-backed forces, to the discourse used within the context of negotiations between Sudan and South Sudan. Here, the conversation largely centers on the negative impact that South Sudan’s secession stands to have on Sudan’s economy. This negative impact, of course, stems from South Sudan’s assumption of control over the vast majority of the previously united Sudan’s oil fields. The International Monetary Fund, or IMF, calculates that Khartoum stands to lose over half of its revenues and 90 percent of its exports as a result of the South’s secession. Given this economic reality, a narrative has developed in the negotiation process that focuses to a large extent on how South Sudan, along with, perhaps, the international community, will fill Sudan’s fiscal gap, which the IMF has calculated to be $7.77 billion. A recent Enough report on the negotiation process details the most recent proposals of the AUHIP and the two parties concerning how this gap could be filled. What goes unnoted in this, and other statements by members of the international community, are questions surrounding why South Sudan and others should help to fill Sudan’s fiscal gap. Few have wondered aloud whether Khartoum could, perhaps, ease its economic troubles, at least in part, by redistributing funds earmarked for military spending to other aspects of the government’s budget. Instead, the international community seems content to consider how South Sudan and, perhaps, others can help Sudan fill its fiscal gap, while simultaneously paying the price for Khartoum’s war against its own people. In fact, the U.N. and its partners recently issued an appeal for $1.1 billion in donor funding to address urgent humanitarian needs associated with ongoing conflict and population displacement in South Kordofan, Blue Nile, and Darfur. The time has come for the international community to reexamine its posture towards Sudan in the context of the negotiations on transitional financial arrangements. While agreement must be reached between the South Sudan and Sudan on this and other outstanding North-South issues, such an agreement should not come without verifiable guarantees from Khartoum that it will, among other conditions, orient its budget away from defense to development and cease targeting its own civilians.